Ensure that your durable linoleum flooring looks and wears well for decades to come with this complete guide to proper cleaning and maintenance. Linoleum has been a practical flooring option for more than 100 years. 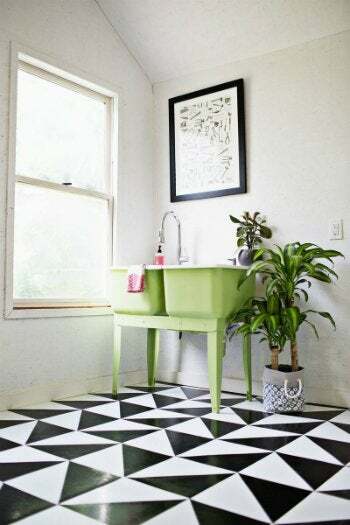 While it fell out of fashion in the late 1940s, when cheaper vinyl flooring entered the market, linoleum has made a resurgence in recent years—no surprise, considering its long list of desirable qualities. 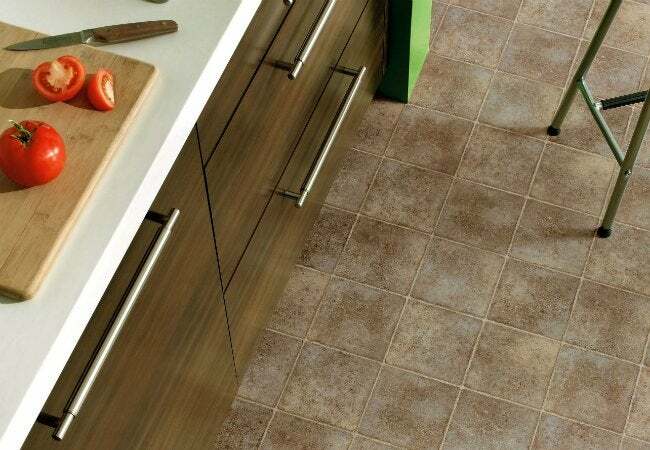 This environmentally friendly, non-allergenic, and highly durable material is gentler to walk and stand on than hard ceramic tile. Plus, linoleum is also naturally antibacterial, making it resistant to mold and mildew. Properly cleaned and cared for, linoleum can easily last 30 to 40 years in a high-traffic area of the home. Whether you have linoleum floors or plan to install it, follow these steps for maintenance, and you’ll be able to enjoy your flooring for years—or even decades—to come. Maintaining linoleum is similar to maintaining a wood floor. Although it is durable, linoleum is, like wood, susceptible to damage from excessive moisture and alkalinity. So, use only small amounts of lukewarm or cool water, and do not use ammonia-based cleaners. It’s a good idea to dust-mop daily to keep linoleum floors free of dirt, and to give them a good general cleaning once a week. To do so, first sweep the floor or vacuum thoroughly using your vacuum’s hard floor attachment. Do not soak the floor, but rather work over it in four- to six-foot sections with a slightly damp mop. Dump out the water, and refill the bucket with clean, cool water, then completely rinse the floor with a slightly damp mop. (Detergents left on the floor will leave a sticky residue and become a magnet for more dirt.) Dry the floor completely with old towels. For a deeper cleaning, follow the same technique but use a soft-bristle scrub brush. To avoid stains, spot clean spills as soon as possible, rinsing the area with cool water and drying it completely with a towel before allowing any foot traffic. If you do end up with stains, because the pigments in linoleum go all the way through the material, you’ll want to buff them out with a nylon brush. Wash and polish the area afterward to bring back its shine. (Obstinate stains may require repair.) Remove black scuff marks by scrubbing them away with a paste of baking soda and water, then rinsing and drying thoroughly. For tougher scuffs, rub a small amount of baby oil or WD-40 onto the stain to lift it, then thoroughly rinse and dry. Linoleum manufacturers recommend polishing floors to protect them and keep them looking great. When the polish on your floor has dulled due to traffic and wear, first vacuum and wash the floor as you would for a general cleaning, but take special care to rinse it thoroughly. After the floor has thoroughly dried, add one or two coats of linoleum floor polish according to the manufacturer’s instructions. It’s extremely important to allow the polish to dry completely between coats. Take care not to move the applicator over any one area of the floor more than once or twice as this can cause streaking, which will require stripping before repolishing. Conscientious care is a small price to pay for great-looking floors. With proper maintenance, your linoleum will serve you well for many, many years. • Be sure to place doormats outside and rugs inside entrances. Dirt and grit are a linoleum floor’s biggest enemy. They will scratch and dull the finish, allowing grime to collect. • Always use colorfast felt pads on the bottom of furniture legs to prevent stains and scratches. • Put protection under plants to avoid water damage, and move plants periodically. Linoleum requires exposure to light in order to keep it from yellowing. • Never put a latex- or rubber-backed rug on a linoleum floor; it will cause a stain. Use only colorfast rugs with natural backings. • Don’t let water stand on the floor—it will damage your linoleum. • Do not strip floors more than once a year. • Never use ammonia-based cleaners, as they will strip the polish from the floor and damage it.